For quality AD/DA, clocking, digital connectivity and routing, at this price there's no competition. High-quality AD/DA. Excellent master clocking. All the digital audio connectivity you could want. Presets disabled under DAW control. There are many 1U interfaces boasting up to 26 channels of I/O. The Orion 32 dwarfs them all with, you guessed it, 32 channels of AD/DA. 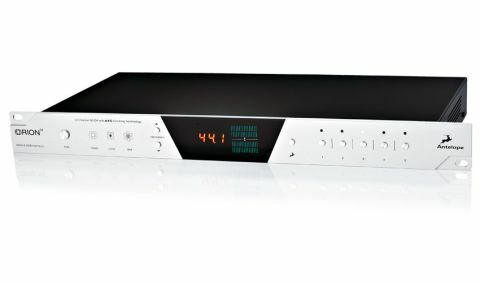 It runs them up to 192kHz and also includes a master clock generator, ADAT, S/PDIF and MADI connectivity with a USB 2.0 interface that pushes the format to its limits. It caused a bit of a trade-show stir, but is it worthy of the fuss? At first sight, the Orion sports an uncluttered front panel. The central display is flanked by the Power button, clocking lock lights and sample-rate selectors to the left, with preset Store/ Recall buttons to the right. The display is split between sample rate and a mammoth 64 channels of level metering, which divide into two blocks and can be assigned separately via the software Control Panel. At only 27mm wide it's not meant for fine level setting, but it does the job for a quick overview. The clocking lock lights indicate when the internal clock is master or when an external source (MADI, ADAT, S/PDIF) has been selected and locked. A third light indicates a 10MHz atomic clock source that overrides the internal clock. The Sample Up/ Down buttons cycle through the seven supported sample rates, although this function is suspended when the USB interface is running (when a DAW controls the sample rate). Lastly, the five preset buttons enable the user to store and recall snapshots of all Orion 32 settings. The substantial connectivity of the Orion 32 becomes apparent at the rear. There are 32 channels of ADC/DAC over D-Subs, two sets of optical ADAT I/O, an optical MADI socket, S/PDIF RCA sockets, USB, four Wordclock outputs, one Wordclock input and a 10MHz atomic clock input. We didn't have all of the sockets connected during testing - this reviewer doesn't have an atomic clock or MADI-compatible equipment, and we only used two external Wordclock devices and three sets of D-Sub I/O cables. It was enough for tracking, mixing and routing a host of outboard, though. "The custom-built USB interface handles 32 I/O channels up to 192kHz "
The analogue I/O is balanced with a maximum level of +20dBu. Many good controllers can handle more level, but this is perfectly healthy and is perhaps part of the trade-off for the sheer number of channels. The Orion uses the SMUX protocol for high sample rates across its ADAT and MADI channels, providing 16 and 64 channels respectively up to 48kHz; 8/32 up to 96kHz; and 4/16 up to 192kHz. The custom-built USB interface handles 32 I/O channels up to 192kHz that come and go anywhere (ADC, DAC, ADAT, S/PDIF). Currently, under Mac OS X, the maximum number of channels above 96kHz for a USB device is 24 In and 24 Out, but Antelope is addressing this with Apple. Windows operation appears to be solid, but there have been teething problems with the OS X driver. For us, that meant the 24-channel limit came into play above 48kHz. Antelope say a new driver is in development to address this and, considering how quickly bugs in the Control Panel software were dealt with, we're confident they'll deliver. Any input can be routed to any output through the Control Panel, enabling the Orion to act as a digital patching matrix as well as a converter. For those with synths and outboard, this is a real time-saver. At the heart of the Orion is an oven-controlled oscillator clock utilising Antelope's Acoustically Focused Clocking. The philosophy is to prioritise the shaping of jitter over simply reducing it - a controversial approach in the niche field of digital audio clock design. "So how does 32 channels of AD/DA sound? Great!" All we can say is that the units we clocked with the Orion sounded great and having four Wordclock outputs meant we could stop daisychaining 75ohm Wordclock cables. That has to be a good thing for clocking accuracy across multiple devices. So how does 32 channels of AD/DA sound? Great! We've listened to mixes through it, tracked electronic and acoustic instruments, mixed through our desk and we have been impressed with the fidelity of the ADC and DAC. Whether it's the clocking, the conversion, or a bit of both, the sound of the Orion 32 exceeded our expectations. Despite the OS X driver issue, we've been able to work at very low latency (64 sample buffer) for simpler tracking and composition work, while only having to bump up to 128 or 192 samples for larger mixes. Our only real gripe is that the presets are disabled under USB/DAW control, which means all routing must either be recalled before loading your DAW or dragged and dropped again. It seems as though Antelope Audio set out to design a multichannel AD/ DA to compliment its range and got carried away, adding a master clock, a mass of digital connectivity and a USB interface requiring a bespoke chip. Cramming it into 1U and keeping the power consumption was optimistic, but it has succeeded. Getting 32 channels of AD/DA at this quality alone would cost way more than the Orion does, but you'd still need a soundcard interface and possibly an external clock to piece it all together. Running all the channels in one box removes the single biggest clocking issue - external sync - and a master clock with four parallel outputs knocks out the other major clocking problem - daisychaining. Our final word? This writer will be replacing 5U of interface and conversion at his studio with 1U of Orion 32 and will still be adding eight channels, without having to cut back at higher sample rates.